First the Super Mario 64 multiplayer romhack, and now this? This week is just retro-inspired all over! 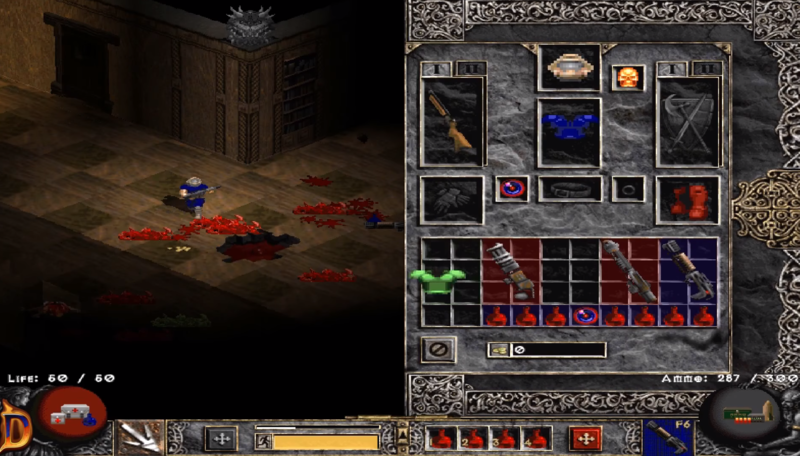 Adding to the list of wacky things nobody thought about for classic games, YouTuber user DolloM has recreated Doom in… Diablo II? Doomiablo (name pending) is a mod of Diablo II that features you playing as the famous Doomguy doing what he does best, but this time in the isometric view of Diablo II. Everything you know and love about Doom is here, but it’ll be played like an point’n’click action RPG. You’ll face off against classic demons like Imps and Revenants. Doomguy will even get new loot in the form of armor that actually change his sprite, new guns that shoot projectiles, and more. This video showcases the current tech demo. DolloM is currently seeking feedback, so if you’ve got some ideas for what could be changed or implemented, be sure to leave a comment on the video! Unfortunately DolloM has also stated that this is a very, very rough demo and there won’t be a playable one for at least a couple of months, if not longer. We’re just wondering whether or not we’ll actually be able to fight the demons and Prime Evils from the Diablo universe. Andariel, Baal, Mephisto, and Diablo had a hard time with the Diablo heroes, but the Doomguy is an entirely new nightmare on his own. Another interesting prospect is the idea of PvP. You can see a sample of it towards the end of the video, and it shows two Doomguys duking it out with various Doom guns. You know, the funny thing is that this isn’t too far off from PvP in Diablo II. Fighting other players in Diablo always consisted of a storm of projectiles on the screen, and it was an elegant dance of who could weave their own attacks in between dodging enemy attacks. This sort of looks like it could be the same thing! Above all, it’s just really interesting that someone came up with the idea to do this. Props to you, DolloM! Thank you a lot for writing this article, very nicely written. To the question whether the prime evils of diablo will be in the game I just want to say that these guys will finally face their real nightmare >: )! Thanks for reading! Can’t wait to see that! !